The feedback from the eBook has been fantastic! You can get a taste of what is included in the eBook by clicking here. 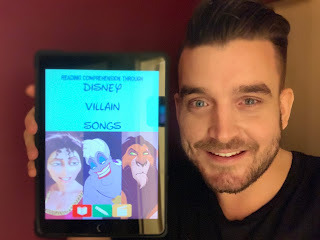 Building on this, I have now written and released another ebook, this time looking at Disney Villain Songs. This eBook is exclusive to the supporters of my Facebook page. This video explains all about the Facebook supporter page. What is a sprout? It can either be the shoot of a plant or describe a young plant growing. Why does Gothel compare Rapunzel to a flower? It links to the reason Gothel wants to keep Rapunzel in the first place, the magic flower. Can you think of a word to describe Gothel? Controlling, selfish, self-centered, manipulating. What evidence from the text makes you think this? Open for discussion. She doesn’t let Rapunzel speak. Why do you think they live in a tower? It keeps Rapunzel hidden away from the real world but also keeps her trapped. What is it that Ariel wants? To be human. Why does Ariel want to be human? She’s always been intrigued by humans on land, collecting items and she loves Prince Eric. Why does Ursula address Ariel as a dear, sweet child? She is trying to lure Ariel into thinking she is trying to help. Do you think Ursula does live to help others? No, she is saying this to mask her cunning, deceiving agenda. What does the word unfortunate mean? It means to have or be marked by bad fortune; unlucky. What does the word merfolk mean? Both mermen and mermaids. How does the last line help Ursula trick Ariel? She is tricking Ariel into believing Ursula is her only hope, her only answer. What does the word essential mean? It means absolutely necessary; extremely important. Why are hyenas essential to Scar? With no backing from the military (the pride) for his coup, for the pride supports brother Mufasa, the wayward royal has had to seek military support from the traditional enemies of the kingdom in order to support his ambitions. Why would scar have never thought hyenas would be essential? As he states in the next line they are crude and plain. Does Scar see hyenas as an equal partner? He denigrates the hyenas. He clearly views them as dispensable tools, rather than deadly partners. Why does he only see a glimmer of potential? He isn’t overly confident in the hyena's ability, but they’re his only hope. The word glimmer shows a slight, little chance. What does the word allied mean? it means to join and work together. Why does Scar use this word? It is a word closely linked to war and that is what Scar envisages, a war for the throne. Can you think of a word that Scar might use to describe himself? Open for discussion, clever as he only thinks he’ll win if the hyenas use his brain.